JUST SOLD 2139 Abbottsbury in Potomac Club SOLD IN 3 DAYS! 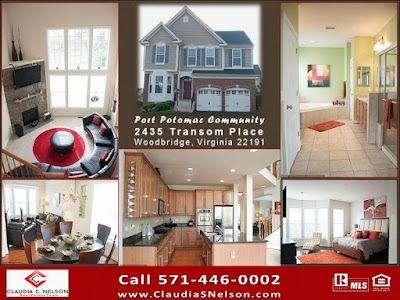 Claudia S. Nelson, Woodbridge VA Realtor, SOLD Potomac Club Home in 3 DAYS! 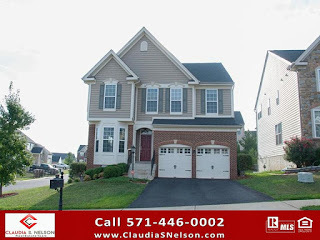 Claudia S. Nelson, Award Winning Realtor and Top Producing Agent with Keller Williams Realty in Woodbridge, JUST SOLD 2139 Abbottsbury in Potomac Club SOLD IN 3 DAYS and FOR TOP DOLLAR at $295,000. Per MRIS, since January 1st of this year, the average sale price in Potomac Club is $282,234 and the number of days on the market is 63. 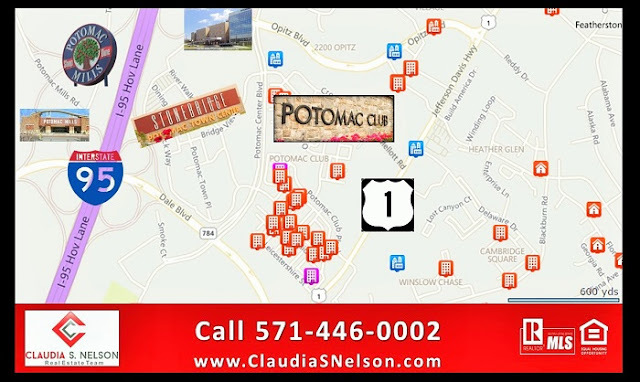 Claudia S. Nelson knows the Potomac Club community and how to market her listings to find the perfect buyer, quickly, allowing her to exceed the MRIS average both on sale price for her client, and selling the Potomac club home 60 days faster than the average Realtor®. 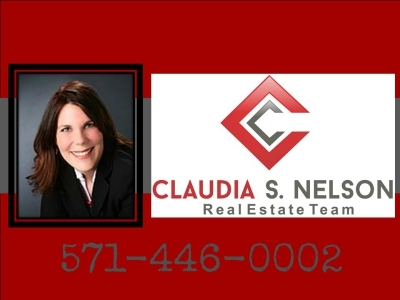 2139 Abbottsbury Way SOLD BY CLAUDIA S NELSON IN 3 DAYS! Claudia S. Nelson never ceases to amaze me! Her systematic approach to marketing every listing like it’s a million dollar home explains why she is the Top Producing, Award Winning Realtor ® with Keller Williams Realty in Woodbridge, Virginia. 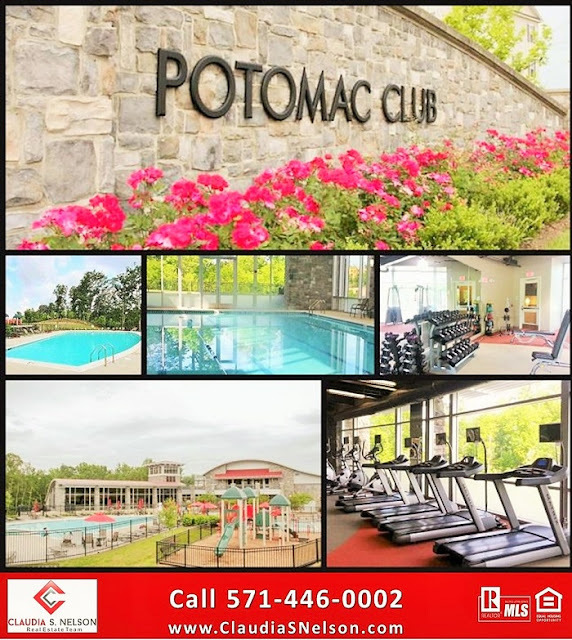 Potomac Club Community is an amenity filled, gated community located across the street from the popular Stonebridge Potomac Town Center. Potomac Club Community offers state of the art amenities in a gated community. This gated community is located on over 200 acres between Interstate 95 and Route 1. Just 1/2 block South of Sentara Potomac Hospital, 1/2 mile North of Northern Virginia Community College (NoVA) and across the street from Stonebridge Potomac Town Center. 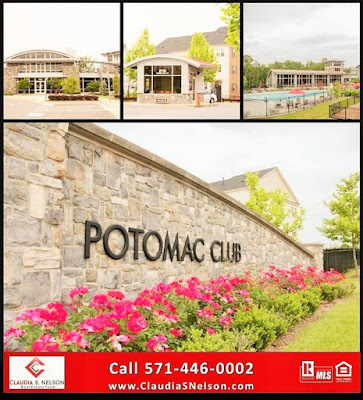 Potomac Club Community offers one of the best places to live for commuters in Woodbridge VA.
Open Monday-Friday 9 a.m. to 7 p.m., Saturday 9 a.m. to 2 p.m.
Keller Williams in Woodbridge VA has a great commercial real estate division. 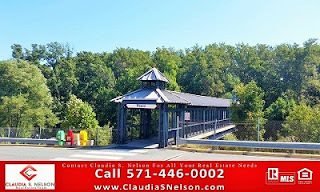 If you are looking for any commercial properties in and around Woodbridge VA you should contact the leader in Real Estate. Keller Williams Woodbridge VA Commercial Property Divison. When it comes to looking for your next office space or you are already in your office space and are looking to seller your office it is very important that you work with a team that specialises in Commercial Real Estate. Keller Williams Commercial Properties can help you find your new office space. If you are looking to rent or buy your office space the team at Keller Williams Commercial Properties is here to help. Call today and I will get you in touch with the commercial specialist at Keller Williams in Woodbridge VA.
Office space in and around Woodbridge VA. Any type of office space, medical, restaurants or anything else when it comes to commercial real estate. You honestly don’t just want to work with any real estate agent. 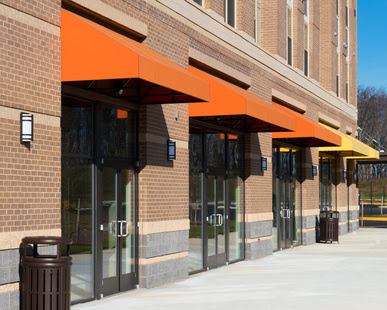 When you are in need of any commercial space in Woodbridge VA or anywhere else in Northern Virginia make sure you ask your Realtor® if he or she specialises in commercial or residential real estate. See most agents specialise in residential real estate and there are only a few who specialise in commercial real estate. Trust me there is a huge difference and not every Real Estate transaction is the same, that’s why you want to make sure your commercial real estate agent is specialising in what you are looking for. The team at Keller Williams Commercial Properties has years of experiences in commercial Real Estate in and around Woodbridge VA. They know commercial real estate. 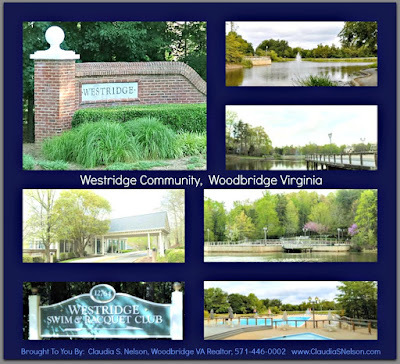 Westridge Community in Woodbridge Virginia offers the tranquility and landscaping of being on a lake resort. Can you imagine coming home to a scenery like this? Are you looking for a Woodbridge Community that offers walking, running trails or neighborhood where you can walk your dog off the streets? The Woodbridge, Virginia, Westridge Community offers all of this in a natural beauty setting enhanced by their uncompromising standards. We would love to show you hundreds of pictures of this gorgeous community, but Westridge is more than just a pretty backdrop, Westridge is an amenity filled community with the Westridge Swim & Racquet Club, beautiful walking trails around the 5-Acre Westridge Lake, Clubhouse, Playgrounds and so much more. 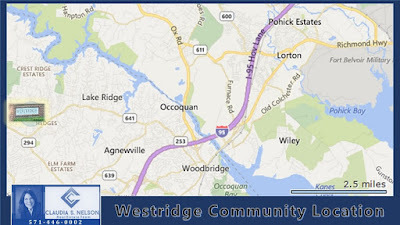 Westridge Community is located in Woodbridge, Virginia off Old Bridge Road conveniently centered near I-95, Route 123 and Prince William Parkway. This beautifully landscaped Woodbridge community is between popular shopping centers Dilingham Square and The Glen. * Please note the school district information as noted in this article is accurate as of 11-20-15. Prince William County School District is always progressing. It is important for you to check the Prince William County Website to see if there have been any changes made to the schools assigned to Westridge Community, Woodbridge. Westridge Elementary School is the Elementary school assigned to the Westridge Community. Westridge residents are fortunate to have an Elementary school located within their community. 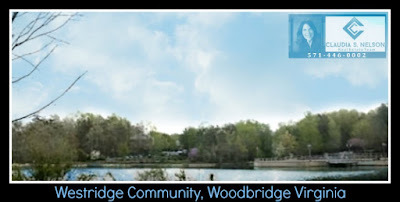 Woodbridge Middle School is the middle school assigned to the Westridge Community. Woodbridge High School is the high school assigned to the Westridge Community. (WMCCAI) as the best community of its kind in Northern Virginia. 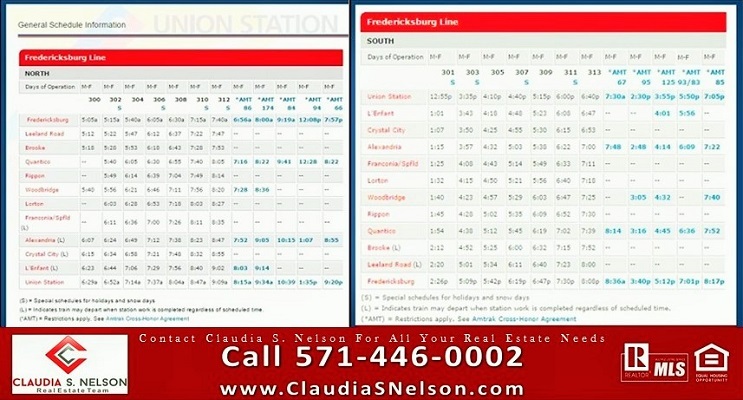 Do you currently live in Westridge and are curious to find out what your Westridge Woodbridge VA Home is worth? November 7, 1 p.m. to 4 p.m.
OPEN HOUSE, This Saturday November 7 1 p.m. to 4 p.m.
We look forward to seeing you this Saturday, November 7, 2015 for our Open House. 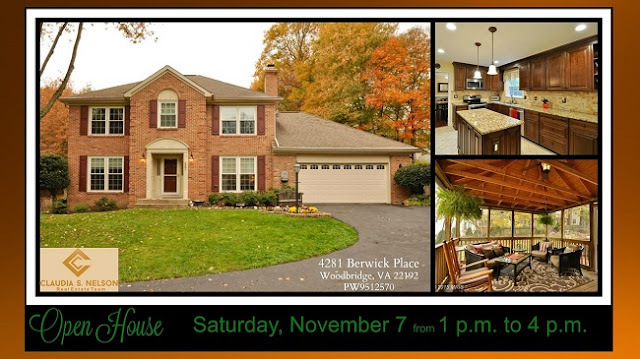 We are very proud to invite you to this Open House at 4281 Berwick Place. This home offers so many upgrades and all the top amenities buyers want. You can learn a lot about a neighborhood from their Homeowners Association. Port Potomac Homeowners Association has their own website, a quite impressive website featuring news, upcoming events like swimming lessons, an end of the year pool party and it sounds like they have a basketball league. The organization involved is really incredible. I have always been so impressed at how beautiful the flowers, grounds look and how everyone is always so nice. 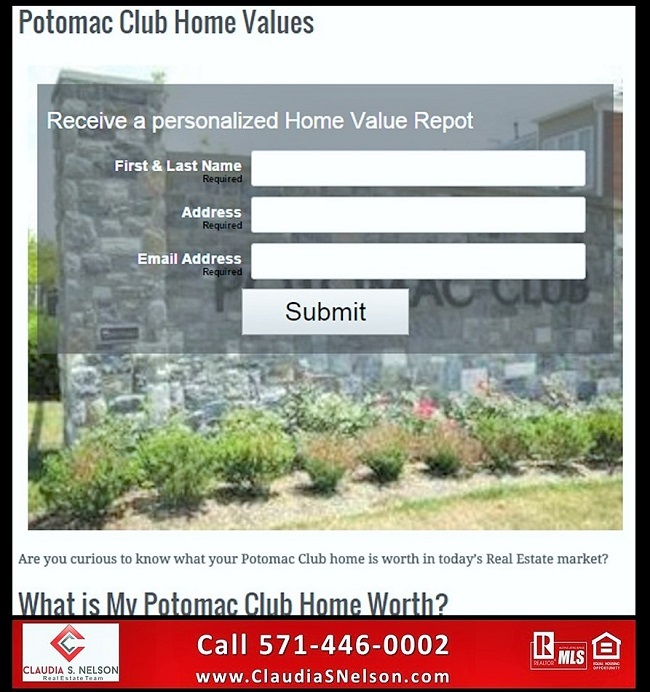 We have helped many clients in this community sell their Port Potomac homes. But, this ti me we wanted to pause and really recognize this community and everything it has to offer. 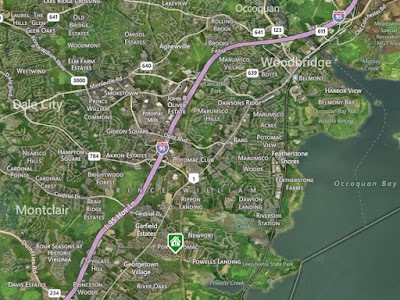 Port Potomac Neighborhood in Woodbridge is located off Route 1 near Interstate 95. This up and coming area is convenient to Stonebridge, Potomac Mills Mall, Northern Virginia Community College & Sentara Hospital. 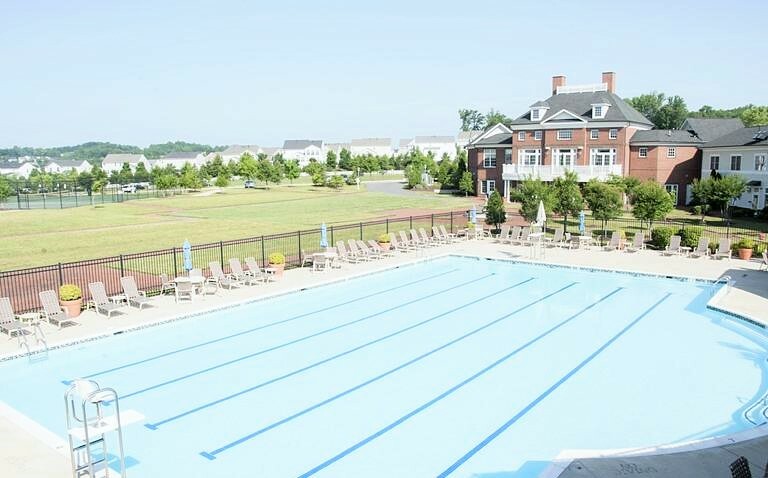 The Community amenities at Port Potomac neighborhood include a 25,000, YES THOUSAND, square foot fitness center with staff. They also provide fitness programs free to the community. Again, they have this clearly organized on their Port Potomac Homeowners Association website for their residents. 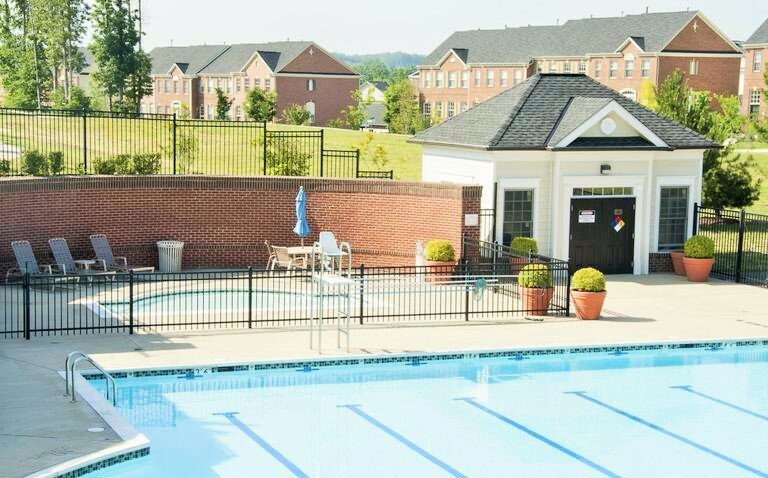 They offer an indoor pool that is open year round and a gorgeous outdoor pool. Port Potomac offers so much for families with young kids, teenagers, anyone with pets or anyone that appreciates breathtaking views. 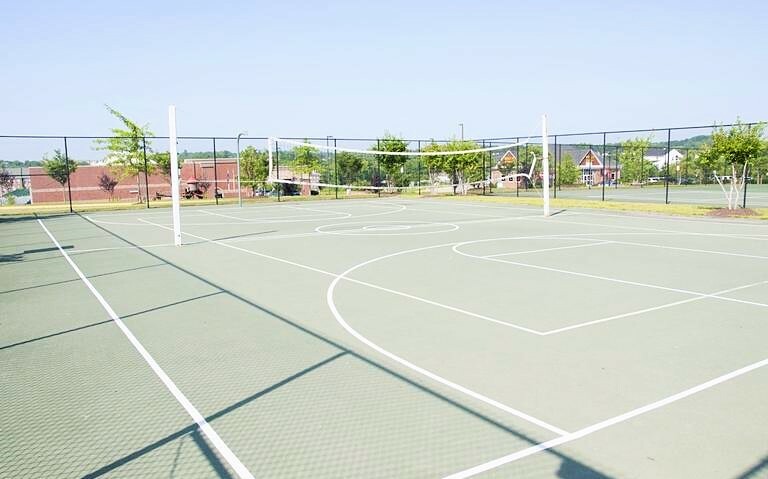 They several tot lots around the community, a soccer field, exercise stations, multi-purpose court, tennis courts, and a dog park. The Clubhouse also has a business center with internet access, computers, fax machines, scanner and copier. They even have on-site management staff available Monday through Friday. Now that’s making sure their residence have everything they need! 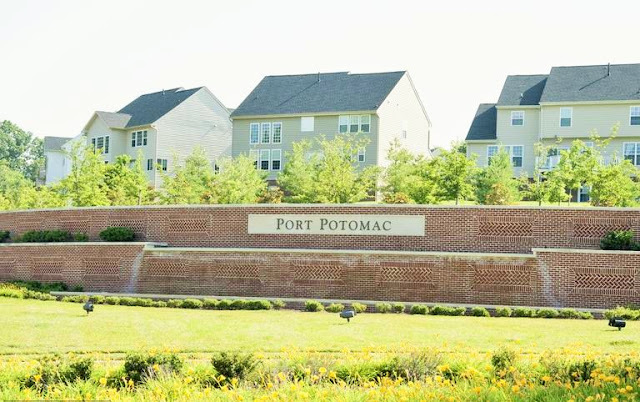 Port Potomac Community has over 900 residences and offers a variety of detached homes and townhouses that offer detached rear garages or front loading garages. Currently this sought-after neighborhood has 27 homes on the market that with Home Values that range in price from $358,900 to $585,990. 400 Acres of Gorgeous Port Potomac Landscaping. The natural beauty, meticulous kept lawns, breath taking views that should count as 400 amenities, right there. 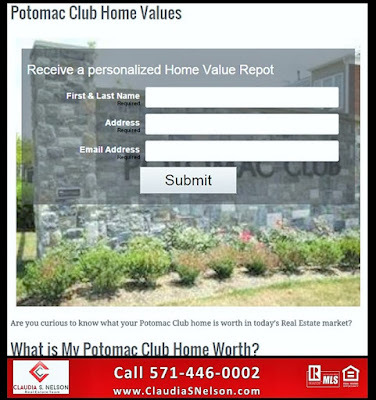 It does begin to explain by why Port Potomac is a sought after community in Woodbridge, Virginia. has the Top, most sought after amenities buyers want. 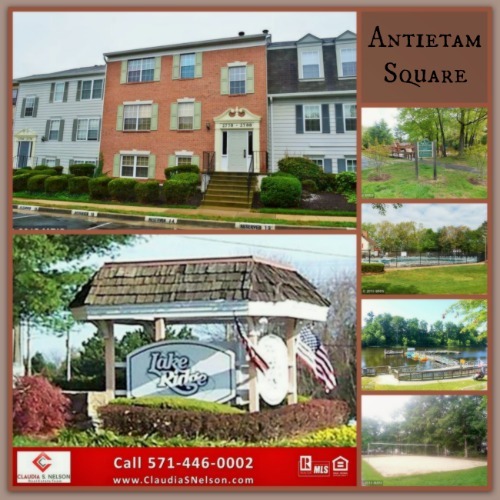 Antietam Square Condominiums in Lake Ridge Virginia is a community of 102 garden-style condominiums located off of Old Bridge Road and Antietam by Woodbridge High School in Woodbridge, Virginia. Antietam Square offers condo living in the sought after Lake Ridge Community. Only 5 miles to I-95 & Route 123 from Antietam Square Condominiums. Centrally located in Prince William County. Looking for an easy commute to Quantico Marine Corps Base? 14 Miles Fort Belvoir? 15 miles Live close to 95 on-ramp, Antietam Square Condominums are 4 miles from Intersate 95. Pcs'ing to Quantico, Orders to Fort Belvoir, Antietam Square Condominiums is the answer to, Where can I find a nice but affordable place near I-95 in Prince William County. Lake Ridge Parks & Recreation Association. Located behind the Old Bridge Softball Field and is an open soccer, football field. 9:15 a.m. to 1:30 p.m.
in the Woodbridge Area, Call or Text Me at 571-446-0002. 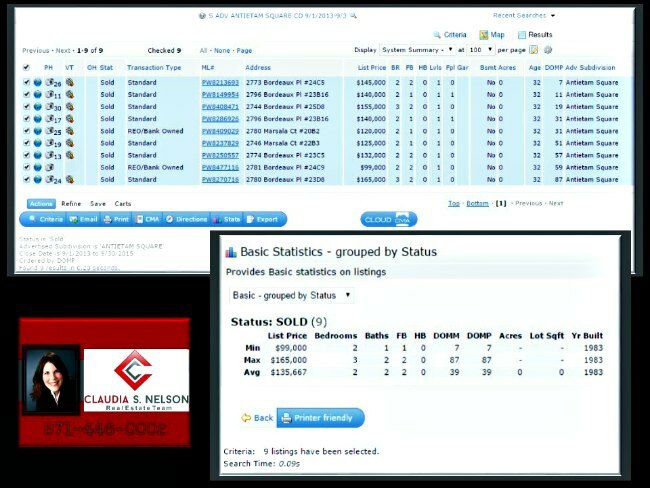 I have been in sales pretty much my entire life and started Real Estate in 2008 at the height of the economic crisis with lots and lots of foreclosures hitting the market at that time. I truly enjoy helping my clients buy or sell Real Estate it is a true honor of being part of this part of my clients life. I became a Real Estate Agent after having a had bad experiences with Real Estate Agents and my ex-husband encouraged me to get my Real Estate license so I would never get frustrated if an agent doesn’t call me back. I inquired about Real Estate licensing classes the same day and have never looked back. I absolutely love what I am doing and would not want to change anything about my passion which ultimately become my job. 2. How much real estate have you personally sold in the last 2 years in Woodbridge? I focus on the Woodbridge VA Real Estate Market and I am the top selling Keller Williams Woodbridge VA Real Estate Agent for the past 3 years. Over the past two years, I have listed and sold 24 homes in Woodbridge alone. This does not include homes I sold in the surrounding area or the countless home buyers I helped purchase in and around the Woodbridge VA area. 3. What is your average List-Price-to-Sales-Price ratio? I just ran a report and my Average List to Sales Price is 97.5 % with an average of 20 days on market. http://www.soldinnova.com/about-claudia-2/testimonials-reviews/6. Can you hook me up with other pros? Yes. I work with different professional in all walks of life. I would be more than happy to providing you with references. 7. Are you a full-time Agent? Yes. I am a full-time Real Estate Agent. Over 50 % of my business comes from returning customers or referrals from happy clients and friends. For that matter, the best compliment I can ever receive is a referral. 9. Do you offer an easy exit strategy from a listing agreement or buyers agreement? Yes, for all my client agreements I offer easy exit strategies. If you are not happy with my service or you decided no longer to purchase or sell, there is no cost for you and I have an easy exit strategy. Rippon Landing Community a Virginia Green Community. Rippon Landing has a small, gorgeous forest with mature trees, lots of history and plenty of open space. 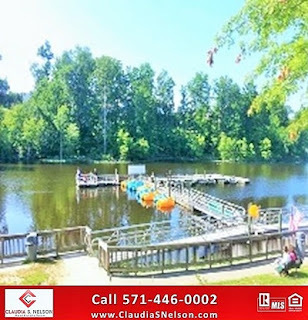 Rippon Landing and all of Woodbridge residents can enjoy the Rippon Landing Neighborhood Park. The Rippon Landing Neighborhood Park is located across the street from the Historic Rippon Lodge. Rippon Landing Community has an abundance of nature, history and a commitment to staying Environmentally "GREEN". They even have a VRE train station in the community. Now that's a community offering GREEN SOLUTIONS! 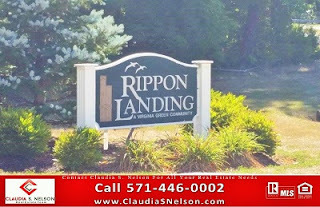 Rippon Landing Community is located in Woodbridge, Virginia. Located a little over a mile to Interstate 95, using on-ramp at Dale Boulevard. Just 28 miles from Washington D.C., Rippon Landing Community is quickly becoming the community of choice for many who commute to Northern Virginia. Rippon Landing Lodge Historic Site 43-acres of historical site in Prince William County, Virginia. Dating back to 1747 Rippon Landing Lodge served as the home to many generations of the Blackburn and Atkinson family. The family legacy lives on with the Rippon Lodge, cemetery, formal gardens, and walking trails. Visitors are welcome to stroll the grounds and gardens. Stunning views of the Potomac River allow for boat and bird watching of all kinds. 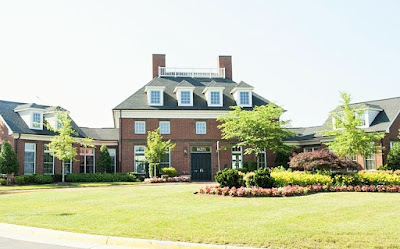 Visit there website to learn more about visiting Rippon Lodge Historic Site in Woodbridge Virginia, be sure to Ask about the private luncheons. Rippon Landing Neighborhood Park in Woodbridge, VA located at 15125 Blackburn Road in Woodbridge. This natural park offers hiking trails, picnic pavilion, tot lot, sand volleyball court, and horseshoe pits. Rippon Landing Neighborhood Park has a picnic pavilion. Picnic Pavilion use is on a first come first serve basis, no reservations are available. In addition to the park, the Rippon Lodge Historic Site is located across the street. 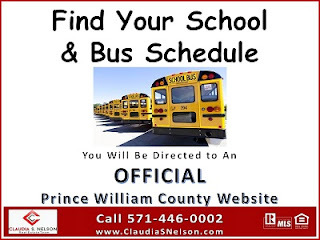 Previously Prince William County Public Schools offered a site that allowed you to enter your address to find which school your child would attend within Prince William County. But, to find which bus your child would ride was not always that easy. Previously there was a list of intersections with times listed on it. You had to try and figure out the closest intersection for your child and then hope that was right. How to find your child's bus stop, time for pick-up and drop-off should not be that hard. WELL, thanks to their new website finding your child's school, bus number #, nearest bus stop and times for pick-up and drop-off just got easier! Rippon Landing is just down the road, less than 2 miles, from the Woodbridge's newest hot spot Stonebridge of Potomac Town Center. Stonebridge at Potomac Town Center is the newest attraction in Woodbridge. Centered around the Wegmans Food Market are several retail stores, restaurants and soon apartments. The stores include names like White House, Black Market, DSW, Anne Taylor Loft, Chico's, Old Navy and much much more. Potomac Town Center restaurants include PF Changs, Uncle Julio's, Firebirds Wood Fired Grill, Starbucks, Potbelly and more. There is also a new Sports and Health Club. Within 3 miles of Rippon Landing is the Famous Potomac Mills Outlet Mall. Potomac Mills Mall is Virginia's largest Indoor Outlet Mall over 200 stores, including Bloomingdale's-The Outlet Store, Neiman Marcus Last Call, Saks Fifth Avenue OFF 5TH, Nordstrom Rack, buy buy BABY, and That! Potomac Mills Circle has been growing over the last few years adding sought after restaurants like Cheesecake Factory, Bobby Flay's Burgers. Rippon Landing Community has a VRE station within the community. There are also many commuter connection options for those that have longer commutes or prefer not to drive at all. With the proximity to I-95, VRE, nearby HOV on-ramp, hot lanes, local bus service and commuter connection options. Rippon Landing offers many transportation options. 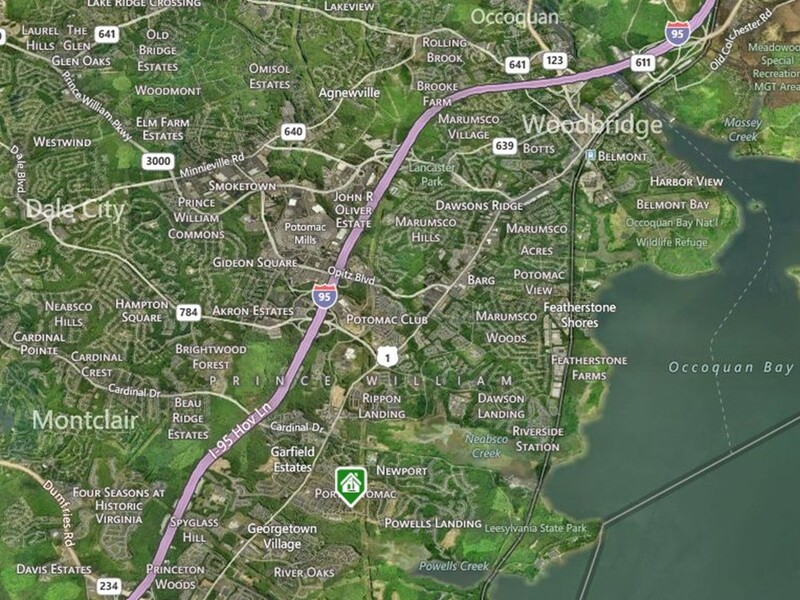 Do you currently live in Rippon Landing in Woodbridge VA? Rippon Landing Woodbridge VA Home is worth? What is my Rippon Landing Woodbridge VA Home worth?